Notes: Based on a four-panel manga series written and illustrated by Kazuho which began serialization in Houbunsha's Manga Time Kirara Carat from July 2008. 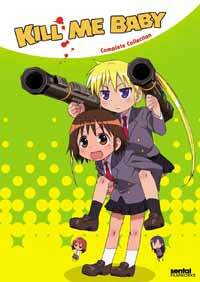 This show follows the daily school lives of an assassin, her pushy friend and (occasionally) a ninja. Another show, another four-panel manga adaptation set in a school to watch. You would think that the industry would have absolutely nothing left to offer in the way of newspaper comic strip laughs, and from the ridiculously stupid premise that Kill Me Baby! has, you would suspect that the show is a clear sign of it. I fear my cynicism is my own fault though, having watched far too many of these kinds of shows and now becoming pretty much inured to the pacing and style of humour that the four panel style tends to offer - even Wagnaria, an otherwise strong show, didn't make me laugh as much as I would have liked. The problem Kill Me Baby! was facing was it has little to offer other than humour, no story to hook us or large cast of loveable characters to keep us coming back, so success would be made or broken on whether Kill Me Baby! could sustain thirteen episodes of consistent comedy with a cast of three and a flimsy premise. Perhaps the funniest thing is that it did and no one is surprised more than I am. The show has the simplest set-up you could imagine. Rather than the group dynamic popularised by Azumanga Daioh and reinforced by K-On!, Kill Me Baby! relies strictly on the rather old-fashioned double act comedy style not often seen in anime. Sonya, the assassin, takes the role of the 'straight man' - aggressive, cynical, unenthusiastic and uncompromisingly serious. Yasuna, the 'ordinary' high school girl, takes the role of the 'comic' - characterised by her mischievousness, sense of wonder and overall lack of good sense. The tradition of Manzai comedy is strong here and, once again, reinforced the idea in my mind that there was no way this show could go thirteen episodes without boring me, it didn't even have novelty to capture my attention. However, the relationship between the two characters works so well that it manages to produce the laughs required without ever straying too far from formula. Pacing is an important part of that and even when the style and substance of many of the jokes is uniform, the way that Kill Me Baby! delivers its humour varies enough to stop the humour becoming routine and predictable. Essentially, the majority of jokes work as follows: Yasuna ropes Sonya into an activity (anything from kite flying to making shaved ice) and then proceeds to play with/torment the resistant Sonya, everything spiralling from there, usually leaving Yasuna with professionally inflicted injuries in the standard slapstick fashion. Yes, slapstick violence is amongst the core of Kill Me Baby! 's humour but oddly, there has never been anyone in the history of comedy more deserving of such violence than Yasuna and yet I found her a very easy character to like. Her regular attempts to wind-up and embarrass Sonya deserve the punishment she receives but there is something wilful and childlike about the character that has its charm. Sonya too has her charm, it is easy to sympathise with her despite her quick temper and the clumsy, reserved friendship she maintains with Yasuna is sweet. Their aggressively competitive rapport rang true to me in a genuinely fun way unlike the often stale relationships found in other sitcoms, anime or otherwise. Character chemistry and dynamism is as important as having good jokes in a two-man routine and if the show sometimes lacks the latter then it glows with the former. Yasuna and Sonya are characters I loved to watch. The only other character that factors into this standard but charming equation is Agiri the ninja. Unsurprisingly, the idea that she is a ninja is the root of most of the humour she is involved in but here ninja, funnily enough, is synonymous with magician - her 'ninja techniques' often resembling ridiculous illusions and tricks that are of no use to anyone. Again, even though there is little deviation from formula, Agiri and her repertoire of parlour tricks and grand illusions are not overused and offer some of the most surreal moments of the show, much to my delight. There are punch lines where there weren't even jokes when Agiri is around. Aesthetically speaking, Kill Me Baby! is fairly middle ground. The soft-lined and simple character designs and backgrounds are nice, have character but hardly take the breath away and the music does its job being unobtrusive though odd. The OP and ED have a character of their own though, the opening polka more interesting than enjoyable to begin with (especially when paired with an equally unusual animation) but the closing theme successfully takes the tradition of having an ending dance animation from its cast and produces a rather entertaining sequence. Go see for yourself. Overall, almost from nothing, Kill Me Baby! seems to have itself a sweet little niche in the congested four-panel market. What it lacks in a large cast, it makes up for by diligently bringing the characters it does use to life. Yasuna and Sonya are good comedians, a double act worthy of the tradition, making up for any monotony in content with a wealth of great pacing, warmth and enthusiasm. Kill Me Baby! is a fun show and I recommend it. Recommended Audience: Aside from the overlying theme that Sonya is an assassin and jokes based upon that fact, you only have regular slapstick to contend with, which is more likely to irritate than offend.